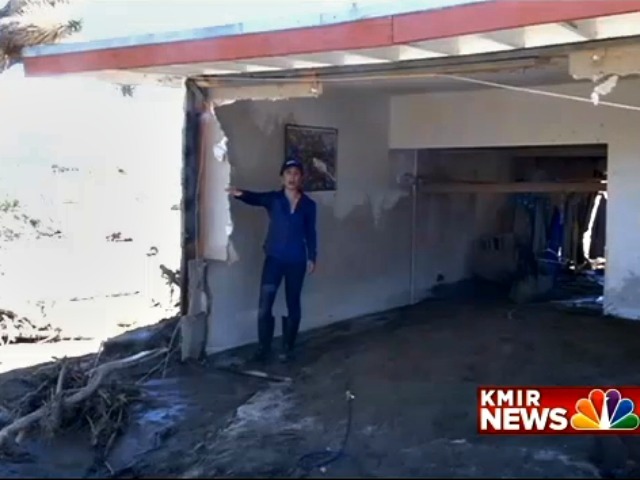 Local Palm Springs NBC News affiliate KMIR reports that a one-year-old boy was washed away in recent flash floods associated with the remnants of Hurricane Odile–and survived. The couple’s home in Joshua Tree, which they had moved into in August, was inundated by flash floods after heavy rains fell throughout the southwest. They are now talking about the experience. The massive flood destroyed their home in Joshua Tree, rising five feet high outside the baby’s bedroom, then building up to the ceiling before destroying another wall and washing the baby away. Tristan traveled 200 feet away, past the barbed wire around the home.